Allergies, skin & coat problems, arthritis, tumors, cancer, cataracts, strokes & heart disease are a few of the 50 major diseases caused by free radicals. Unfortunately, these diseases lead to suffering & premature death in our pets. 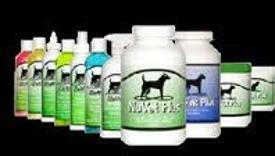 The Veterinarians, Physicians, Pharmacists, & Nutritional Scientists of NuVet Labs have blended a precise combination of human grade, natural vitamins, minerals, herbs, antioxidants, bioflavonoids, fatty acids & amino acids proven to combat the ravages of free radicals & to provide immune system support. Puppies & kittens to senior dogs & cats should start on the path of disease protection today! NuVet Plus can be especially helpful for the white boxers & white dogs that are known for skin problems, hot spots & itching! NuJoint Plus can surely help your dog that has arthritis already!